Well THAT Was Disappointing ..
What at first appeared to be a reach out to get input for a post-SCOTUS ruling direction was just a scam. Not at all surprising however. Given that it was from team Benishek. I though perhaps he was noticing how folks have lost all respect for him, and as contrition, was reaching out to see what would make folks a little more confident in his future performance. Gosh, maybe it was in response to my put up or shut up articles! With more than three decades in the medical field, I know how important it is for our healthcare system to empower patients and their doctors, not federal bureaucrats in Washington. Too often, Washington politicians try to pass laws without talking to the people who have to live with the consequences. Any doctor will tell you that listening to your patients is one of the most important parts of medicine. I believe this is true in politics as well. That’s why I want to hear from you. 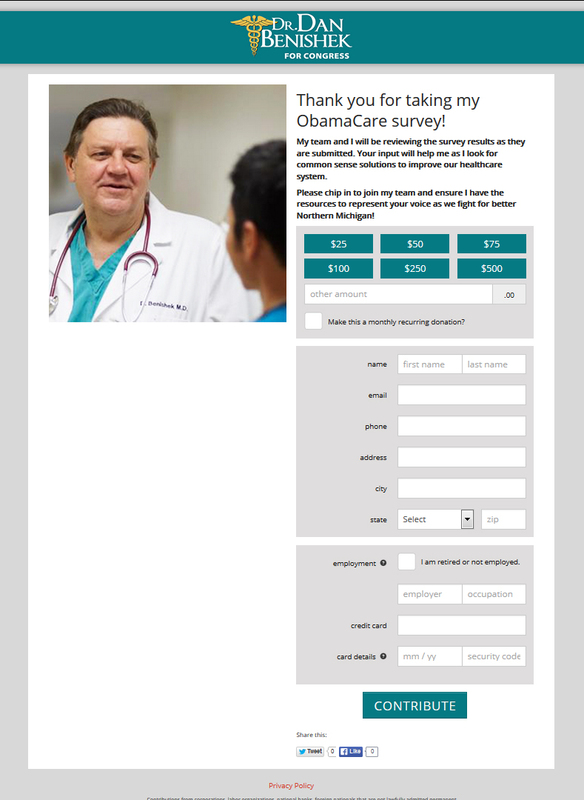 Jason, please take my survey to let me know what you think of ObamaCare, and how we can build a better healthcare system. Our current system isn’t working, and I know we can do better. With your support, we can fight for a bottom up healthcare system that empowers people not politicians. “It needs to be defunded. Period. NO Reform, NO Replacement, simply eliminate this unconstitutional intrusion into our lives. Congress has the power to do away with it, but lacks the spine. My wife and I had insurance for 19 years, and now have NONE, unless we submit to ‘government insurance,’ which is more costly, intrusive, and not worth a quarter of what we were able to buy before. Then I hit the “Share your thoughts” button. I was feeling the rush of accomplishment! I did as I was asked! I participated in the process! 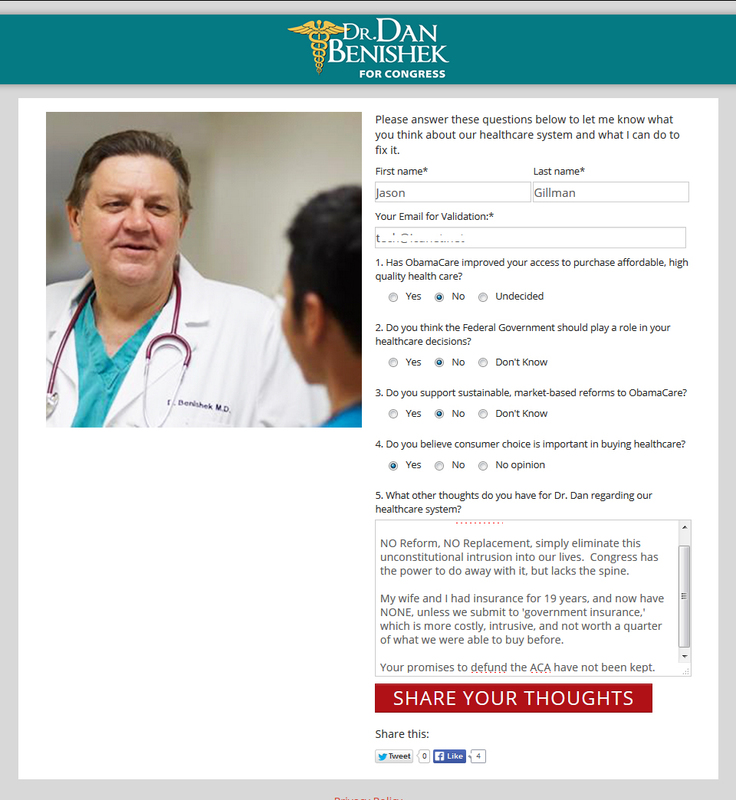 I did my part, offered suggestions and even added a little friendly critique of the good doctor’s performance over the last 4 plus years (since that time when he promised to defund Obamacare) that he has had a vote in congress. As it turned out, the request for an opinion was merely a rehashed shakedown for cash; and only six months into the newest session. What??? Its just a solicitation!? Heck, Even the 4 FB likes showing on the first page disappeared when the greasy surgeon’s palm was thrust forward. Buh-Bye! Golly, what on earth was I thinking? Actually, you could've had some some with this schemp. On the next screen when he's whoring himself, just submit a donation of $0.00 and hit send. I'll guarantee that you'll open up more eyeballs in his office with that response, than anything you could've written on his "survey". or even two cents. Run it on my Amex. Too much coffee this am..
Actually, you could've had some fun with this schemp. It could only be a disappointment if one had any expectations out of this sleazy, Medicaid billing Yooper schmuck who was in the right place at the opportune time of this assclown cutting deals with the ghey Kenyan-in-chief. Evidently, $7 mil in his 'retirement fund' isn't enough...How much did you send him?? ?